I don’t know how many students you have, but each year I have around 150. To some, that might seem like a lot. To others, it might seem low. To me, it seems normal. 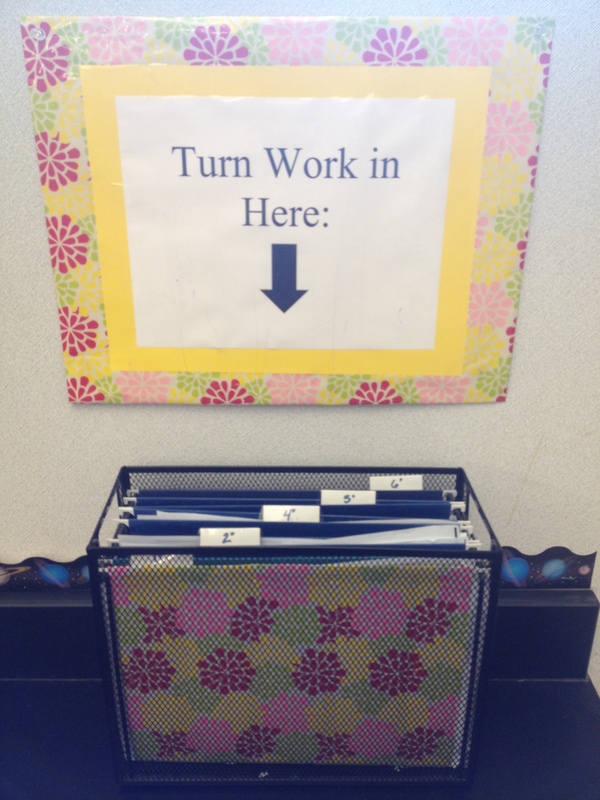 With 150 students coming in and out of my classroom everyday, it is imperative that I stay organized. My main necessity for remaining as organized as possible is the amount of papers I need to keep track of. On average, I collect about 2 items from each student per day (usually their homework and then whatever worksheet/lab they used during class). If I don’t stay on top of my grading, I can easily have 600-900 papers on my desk. 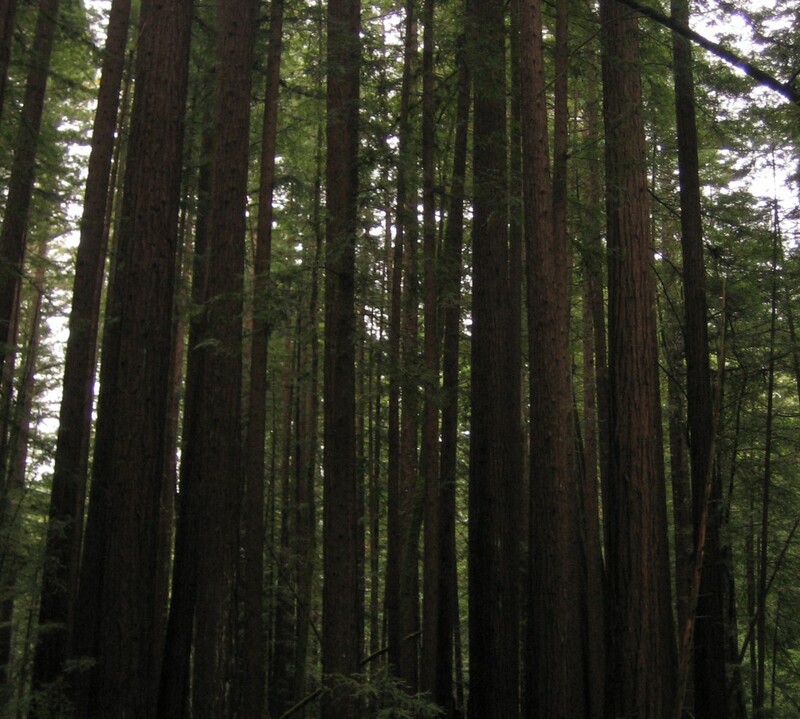 Without being hyper-organized, I could easily feel overwhelmed. Or worse: I could lose papers! Every teacher’s nightmare!! Students always think we lose their papers- but we know that more often then not they still have it in their binder or forgot to put their name on it. 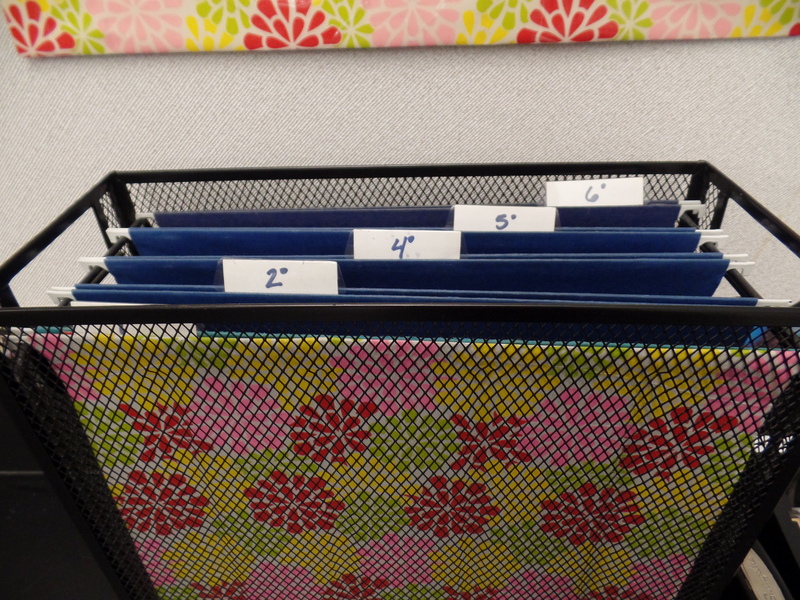 After I take the papers from each period’s specific folder in the in-box, I separate the papers by assignment, paper-clip them together (or binder-clip them if it’s a big stack) and I put them into a corresponding folder for that class period that I keep on my desk and grade when I have a chance. 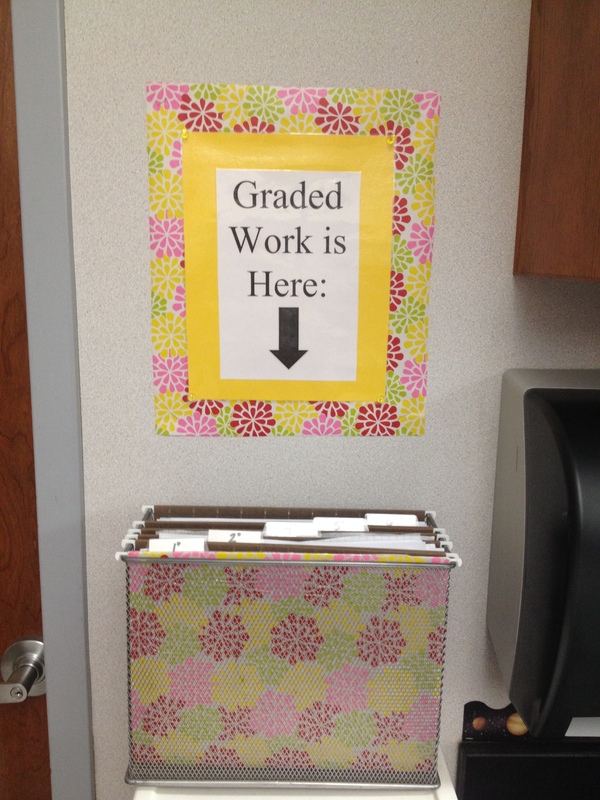 Once done, I put them into my graded “out-box” that is also organized by class period. This method has always worked for me and is easy to train the students to use the in and out boxes as it’s pretty straight forward. When you have 150 students, it can become difficult to keep track of who was absent, who was sick, who had an orthodontist appointment, etc. To avoid repeating what the assignments were during their absences, I have a log hanging in my classroom that has the date assigned, the date due and a description of the assignment. 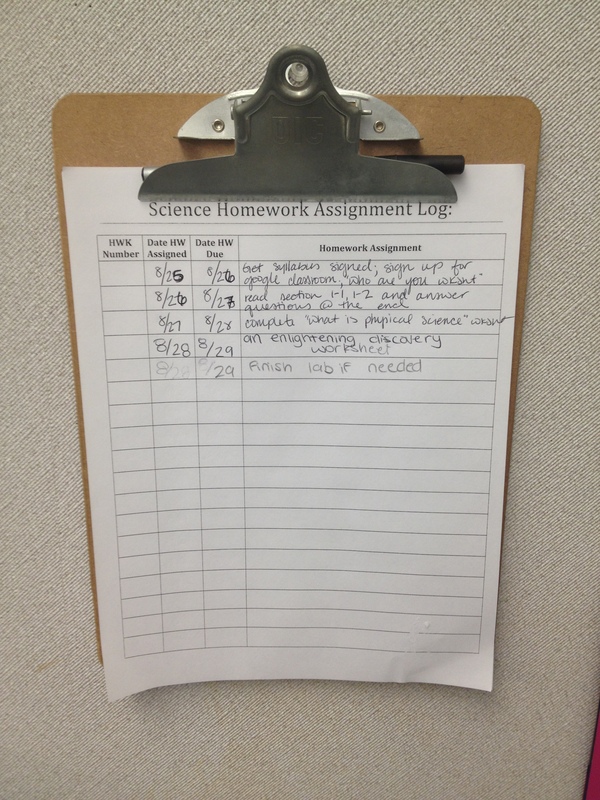 this way, when students come back, they just check the homework log and get on their way with catching up. I find this VERY helpful! (especially during cold/flu season) Hint: Assign the task of writing the daily homework to a student in your first period class so that you don’t have to worry about it. My main desk drawer holds a LOT of daily necessities. I wanted a way to organize it without breaking the bank. My main goal, was to not have everything shoved haphazardly in that drawer. I decided that the answer was compartments! As you can see, I used short plastic cups to hold the smaller things that I need: paper clips, binder clips, tacks, etc. Then I used cheap baskets from the Dollar Store and Target’s dollar section to house my small stamp collection and pens. (Yes, that IS a “mute” button controller, but I will talk about that one when I write about my classroom management techniques). I’m pretty sure that teachers have one of the few jobs where staying home when sick is MORE work then just going to work and trying to make it through the day. I hate making sub plans. Not only that, but I am laying at home worrying about my classes. I wonder if they are being respectful to the sub, if they are being kind to each other, if they are trying to get away with things they wouldn’t dare try with me! I mean, they ARE middle schoolers after all. 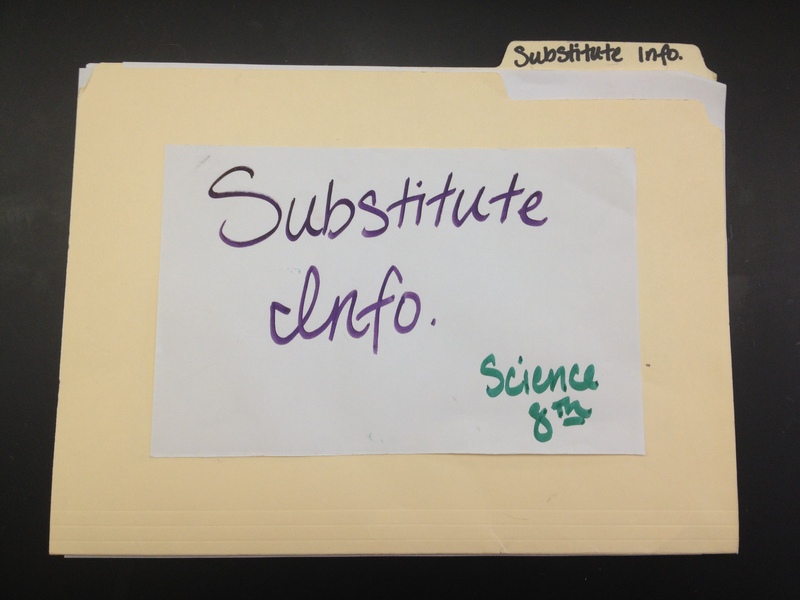 That is why, to make my life MUCH easier, I have a specific “sub folder” that I keep in an unlocked drawer in my desk. This way, if I am sick, I can just call one of my colleagues and ask them to lay out the folder for me and print the plans. My folder contains: seating charts, classroom procedures, directions for the various review/academic games I play with them, directions for the projector/TV/DVD player, emergency information, and an emergency lesson plan in case I am SO sick that I cannot even get to my computer to type something up. This folder has totally saved me on multiple occasions. Seeing 150 students each day can be daunting when they are all asking the same questions that could easily be rendered unnecessary with one small change: self help! I got this stackable unit for free as a hand-me-down from another teacher and, boy, has it come in handy. This is where I keep all student supplies. 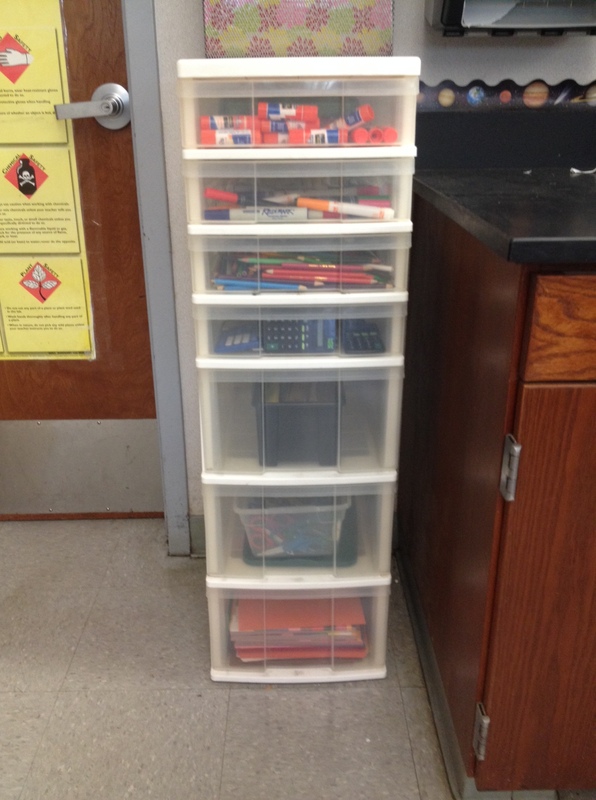 This unit is helpful for multiple reasons: they are not constantly coming up to me asking where the rulers, calculators, construction paper, glue, colored pencils, scissors are- they already know! They are able to help themselves to whatever they need and self monitor. Lastly, because they are the ‘student supplies’, they are in charge of keeping it nice and organized; and they do! I get it started for the first day of school, and they take care of it for the rest of the year. Of course they tell me if a supply is running low (like glue sticks), but other than that- it’s all on them. It’s a good system. I like to make copies of things I will need for the week on the Friday before. I have this nice staggered stackable unit (on the middle shelf) that allows me to see what the papers are, and makes it easy to take what I need. 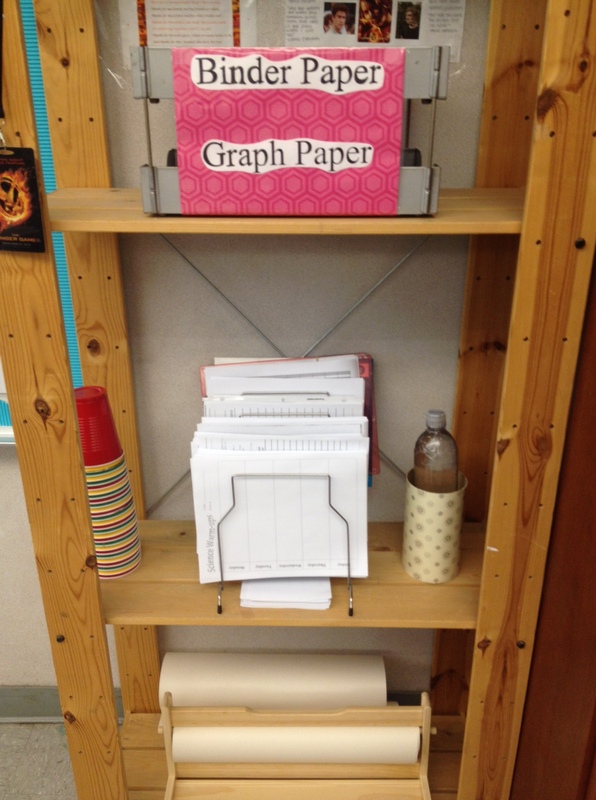 I also have binder paper and graphing paper for students who need to ‘borrow’ from me. At the bottom of the unit, I have rolled butcher paper that I bought from the children’s section at IKEA. VERY cheap and has come in VERY handy! This is WAY more reasonable than buying this type of paper from an office supply store and for a few extra bucks, you can also buy a nice wooden holder. 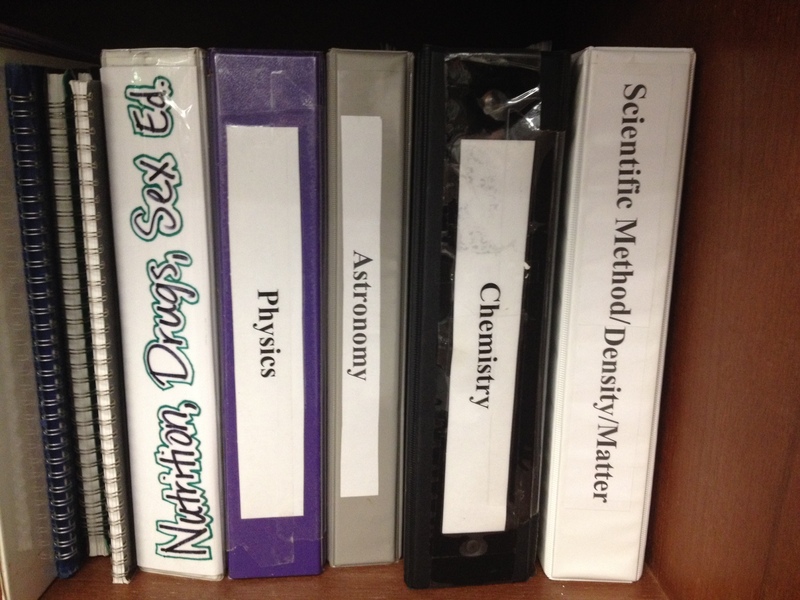 Lastly, I like to keep all of my hard-copies of documents organized by subject matter in labeled binders. I put each printed document in a clear sleeve that protects it and helps to make it easier to flip through the resources in my binders. This is another trick I learned from my master teacher and I have used it since leaving her wonderful guidance. It has proven to be VERY helpful over the years. I also keep all of my documents organized on my computer for easy alterations and modifications. To help with my digital organization, I use a free service called Dropbox. This service is great because it allows me to access my files from any computer with internet access and it automatically syncs my files with all computers I have linked to my account. It’s great and you should definitely check it out. You will NOT be sorry. 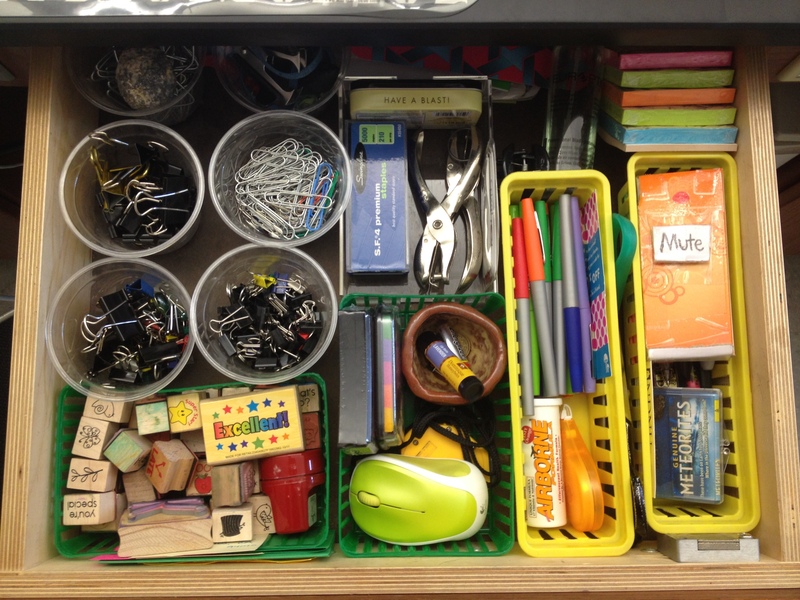 I honestly hope that these strategies that I use can help you to become more organized in your own classroom and more efficient. At least for me, I have found that when I am organized, I can focus more and I waste less time trying to find what I am looking for. 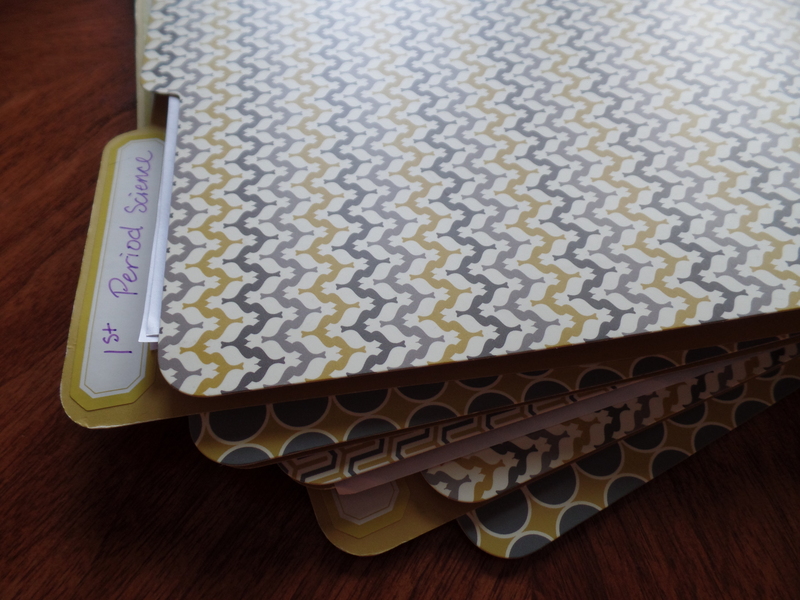 If you have any great tips for organization, leave a comment and share it with the rest of us! Great post. I always love to hear of different classroom management strategies. I’m especially curious of that “mute button”. One thing I appreciated is your homework log. While I do keep weekly handouts in a hanging wall file by subject, I think the additional log may help them get info without having to ask me what they missed. I’m glad you found the homework log useful! I will probably let be posting my classroom management piece this week, so keep an eye out so you can learn more about the mute button (and much more!). Thanks for the tip on the “insert read more tab”. I’ll try doing that, thanks! Do you use anything else of Google’s for your teaching and classroom? Just google docs and calendar, but not as much as I would like! I’m really enjoying google classroom though- it’s awesome! That reminds me that I actually need to try Google Classroom. Looks like a great tool. Many of us are currently using BlackBoard, but I think Google classroom will be a better way to connect in the future, and it will teach students how to make use of Google’s products, which many of us use in real life! BlackBoard really just stops its usefulness when students graduate or leave your class (as you need to unregister people, thus causing them to lose all their work). But with Google Classroom, I’m assuming students have access to that work for as long as the teacher makes it available to them. This is giving me ideas for a future post!